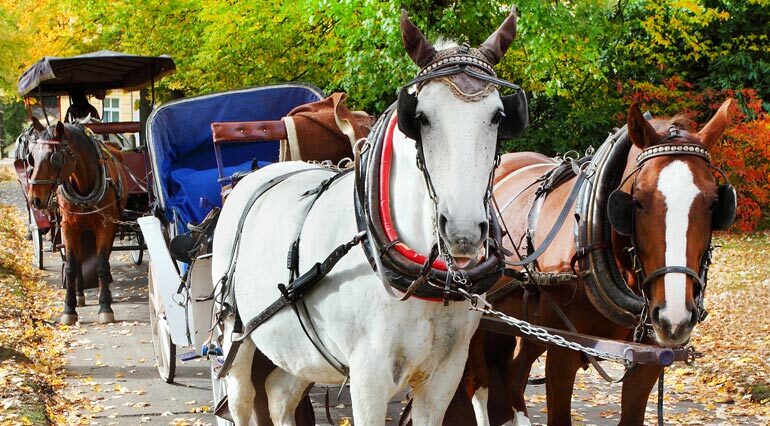 If you provide Horse Drawn Vehicle Ride Services [HDV Rides] to the public, you have a liability exposure that is not easily and well-insured by many insurance companies. If you are paid or compensated in some way for these services, you have a commercial venture that is not insured under a Homeowner’s or Farm Owner’s policy. Horse Drawn Vehicle Ride Services range from providing wedding rides for the bride and groom on their wedding day, to giving rides to up to 16 people at a time on a wagon or trolley at large events, like fairs and festivals, and to the general public on city streets and in parks. Hayrides are popular in the fall and sleigh and sled rides are often done in ski resort areas, and at Thanksgiving and Christmas events. With this business, your greatest liability concern is the potential for serious bodily injury to happen to multiple passengers, bystanders, and property damage if you should experience a runaway, overturn, or collision. If you are operating in a rural area, your risk is lower because you are carrying fewer passengers and have less exposure to the city. Regardless of the route your carriage or wagon takes, you should protect yourself with the right equine liability insurance policy. As an operator, you worry that you may be sued or otherwise have a claim made against you for bodily injury or property damage by a passenger, guest, or someone else who comes in contact with your horses and vehicles. If sued, you will need to hire a lawyer to defend you and you wonder how you would go about doing this. If found negligent or responsible, you would likely have to pay for either a court-ordered or agreed-upon settlement to the injured party. Fortunately, much concern can be relieved when you buy a Commercial General Liability Policy [GL] to insure Horse Drawn Vehicle Ride activities. Commercial General Liability Insurance protects you from financial loss should a passenger, guest, or someone else become injured [Bodily Injury] or their property is damaged [Property Damage] in relation to your business, and they make a claim or file a lawsuit against you for damages. How Risky are Horse Drawn Vehicle Ride Services? High Risk. Horse accidents happen regardless of how well trained your horses are because there are external factors that need to be considered such as bystanders and urban locations. Depending on the degree of the accident, you could potentially be sued, so you should protect your business with a horse insurance policy that covers your activities. Our team can provide you with a horse insurance quote that meets your specific needs, especially if you are an owner of a horse-drawn vehicle ride service. HDV Rides, on the other hand, often operate in crowded, open, unfamiliar environments where there is more stimulation to scare a horse. There is greater potential for more people and personal property to be injured and damaged because of passenger load and the fact that there are more people around in open areas. These factors are what categorizes the HDV Ride exposure as High Risk. 1. A horse and vehicle come too close to a car on the street and cause damage to it. 2. A passenger injures a leg, ankle or hip while stepping into or out of the vehicle. 3. Passengers are injured and their personal items are lost or damaged when falling off or jumping from a vehicle. 4. Autos, buildings, lawns, or other property are damaged when a horse pulling a vehicle becomes frightened and runs away uncontrolled. 5. A horse bites, kicks, or steps on a bystander who gets too close to the horse. Speak with horse insurance representative from Ark Agency by calling 1-800-328-8894 today.